Today we’re pleased to announce the release of our newest home solar panels — our most efficient and powerful yet. 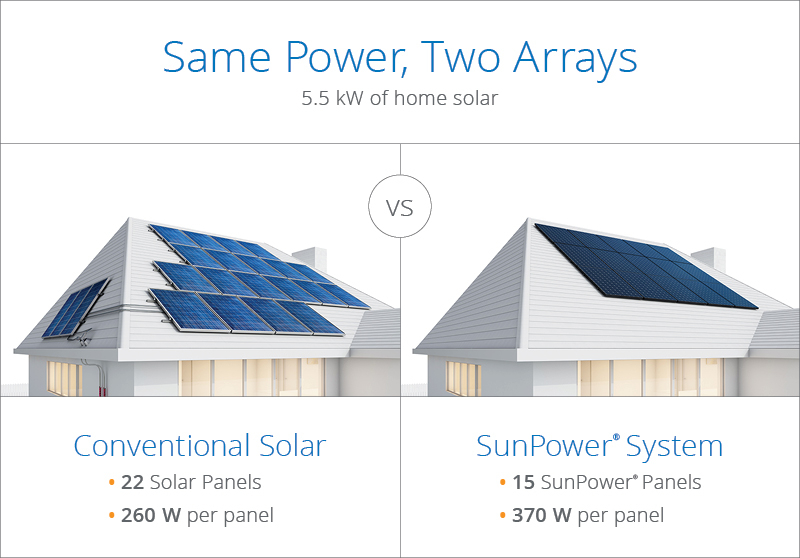 SunPower’s new 370-watt residential solar panels offer 20 to 40 percent more power per panel than conventional solar panels.1 With these high-efficiency panels, you’ll create more clean energy from the same space. And more power means you’ll save more on your monthly electric bill. How Do Powerful Solar Panels Save Money? Solar panels come in a range of power outputs, and some are more powerful than others. Simply put, every watt of clean, renewable solar energy you produce on your roof (or over time, kilowatt-hours of energy) is electricity you’ll avoid buying from the grid at prices you don’t control. More of your own solar power means more control and a higher offset of your electric bill, and therefore more savings. To get a sense of your home’s potential, try our solar calculator. Let’s translate this to a real case. On any given roof, you’d want your solar panels installed in the spot that receives the most sunlight, meaning it’s unshaded and exposed to the south or west. Our new 370-watt panels will produce more than 40 percent more power than if you had installed the same number of conventional solar panels.2 This will help you offset more of your monthly electric bill so you can save more money. Or, in the example below, let’s assume you want a 5.5kW system to generate a specific amount of power to offset your electric bill, but you don’t have a lot of roof space or you just like the look of fewer panels, for a more minimalist appearance. 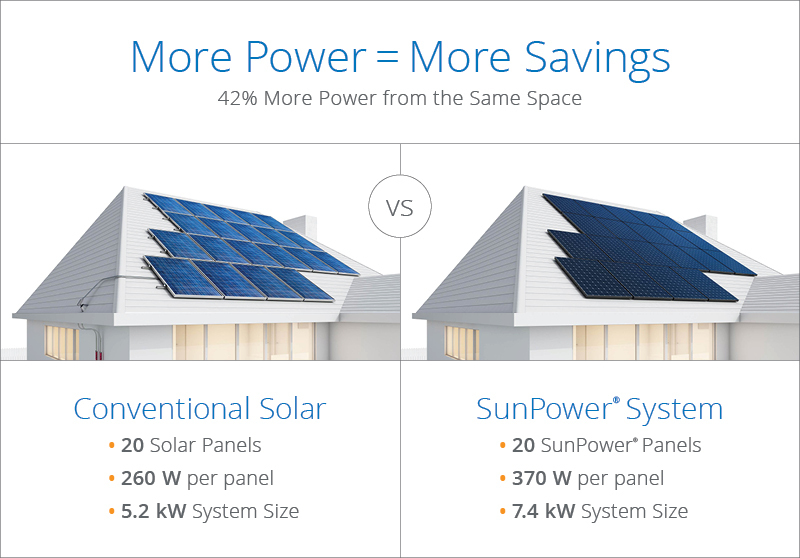 If you choose SunPower’s 370-watt panels, you’d only need 15 panels. To build a same-sized system with conventional panels, you’d need 22 panels. So, with SunPower, your system has a much smaller footprint. And the conventional system has so many panels that you’d likely have to place some in an area that receives less sunlight. So, over time, those conventional solar panels will produce less energy than the optimally-placed SunPower panels. Lastly, remember that how your panels work with the entire solar power system matters to its long-term performance. Only SunPower panels are installed as part of the SunPower Equinox™ system — the only residential system that is completely designed and engineered by one company to work together. That means your panels, microinverter, racking system, monitoring hardware and software are all SunPower products that we have optimized for your savings and peace of mind. And all parts on your roof are backed by SunPower’s Complete Confidence Warranty for 25 years. Visit our home solar page to sign up for a free evaluation. 1 ,2 SunPower 370W compared to a Conventional Panel on same sized arrays (260W, 16% efficient, approx. 1.6 m2) (Campeau, Z. et al. "SunPower Module Degradation Rate," SunPower white paper, 2013).